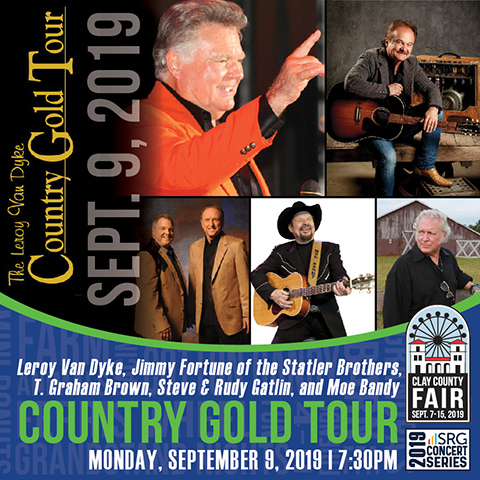 The Clay County Fair announces the Country Gold Tour, starring Leroy Van Dyke, Jimmy Fortune of the Statler Brothers, T. Graham Brown, Steve & Rudy Gatlin, and Moe Bandy, as part of the SRG Concert Series in the Sleep Number Grandstand at the 2019 Clay County Fair on Monday, September 9 at 7:30pm. The Country Gold Tour, by definition, is a stellar evening featuring renowned classic country music performers who have topped the charts and had massive media exposure. Enjoy them in person as they perform the celebrated Nashville sound that took their music around the world and back including hits like “Auctioneer,” “Walk on By,” “All the Gold in California,” “She Used To Be Somebody’s Baby,” “Elizabeth,” “My Only Love,” “Too Old to Die Young,” “Don’t Go to Strangers,” “Darlene,” and more. Tickets will go on sale Friday, February 15 at 10:00am. Prices are $27 (general admission stage front seating), $27 (reserved Grandstand seating), and $22 (general admission bleacher seating). Tickets will be available online at www.midwestix.com, by phone at 515-244-2771, or in person at the Events Center Box Office. There will be no additional fees applied to any of these purchase methods. Please note Grandstand guest services changes for 2019. Bag checks will be implemented at all Grandstand events at the 2019 Fair. The following items will be prohibited: weapons/firearms, alcoholic beverages not provided by the Fair &amp; Events Center, air horns/whistles or other noisemakers, helium-filled balloons, glitter/confetti, glass bottles, fireworks and illegal substances. The Fair will also sell beer at selected Grandstand events during the 2019 Fair. About The Clay County Fair & Events Center: Rooted in Tradition, the Clay County Fair and Events Center is a year-round facility that annually hosts more than 300 events, including its signature event, the Clay County Fair. Known as “The World’s Greatest County Fair” since 1917, the Clay County Fair attracts more than 300,000 guests each September for nine-days of world-class entertainment, competition, food, fun, and the largest farm machinery show at any fair in the United States. Additional information can be found at claycountyfair.com.